Dogs and cats adopted from the Burbank Animal Shelter are provided with a medical exam, flea treatment, vaccinations and microchip. Dogs, cats and rabbits must be spayed or neutered before going home with their new family. $125 unaltered dog adoption. Includes spay/neuter, vaccinations, microchip, and adoption fee. 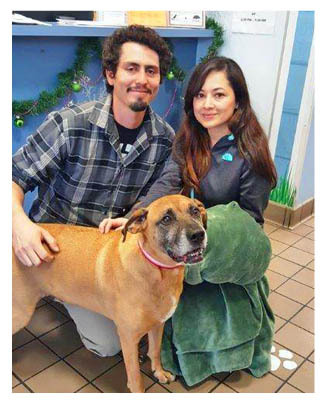 $90 adoption for dogs spayed/neutered prior to arriving to the Shelter. Includes vaccinations, microchip & adoption fee. $85 unaltered cat adoption. Includes spay/neuter, vaccinations, microchip, and adoption fee. $50 adoption for cats spayed or neutered prior to arriving to the Shelter. Includes vaccinations, microchip & adoption fee. $30 unaltered rabbit adoption. Includes spay/neuter surgery adoption fee. $15 adoption for rabbits that were previously spayed/neutered prior to arriving to the Shelter, includes adoption fee. Fees vary by animal. Contact staff for details. Due to the careful attention provided when conducting animal introductions and processing adoptions, animals cannot be shown later than 4:30pm Tuesdays-Saturday and later than 2:30pm on Sundays. Adoption fees are waived for all United States Military Veterans. To have adoptions waived, veterans must show proof of veteran status either by presenting the shelter a Certificate of Release/Discharge from Active Duty or their retired United States military identification card at the time of adoption. Veterans are limited to a maximum of 3 adoptions capped at a maximum of $1500 in adoption subsidies. The Burbank Animal Shelter is a proud Pets for Patriots adoption partner. 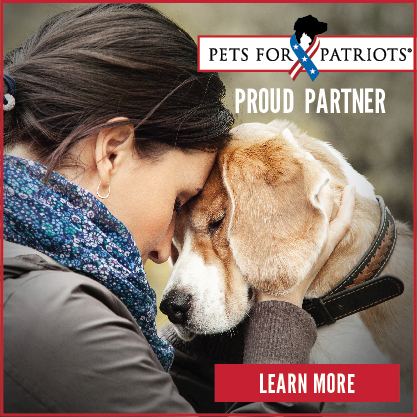 Veterans can adopt eligible pets through the Pets for Patriots program to receive a waived adoption, a one-time $150 gift card to a major pet retailer for pet food and supplies, and a minimum ongoing 10% fee discount for medical care with any of the Pets for Patriots veterinary partners. Shelter animals with the Pets for Patriots logo are eligible for adoption under this great program. If you are a veteran and would like to be pre-qualified, apply here. Licensing is required for all dogs and cats in the City of Burbank. The Burbank Animal Shelter licenses dogs, cats and horses for City of Burbank residents only. Your dog will be given a permanent license tag number. 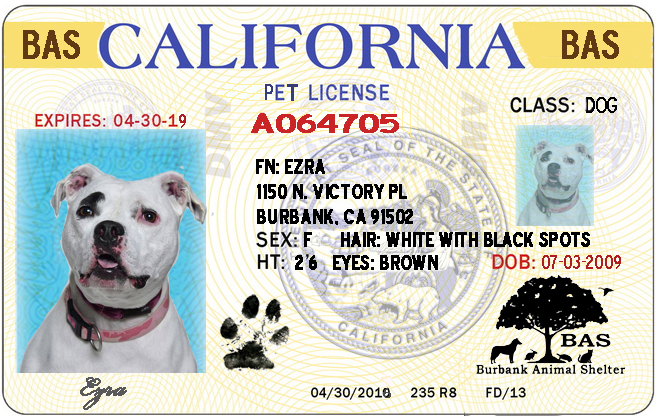 Once your dog has been assigned a license with a distinctive tag number, the number and information about your dog is permanently filed in our records. Within thirty (30) days after entering the jurisdiction of these ordinances. Failure to obtain a license as listed above, or to renew by the expiry date will result in a late fee. Rabies vaccination must be effective through the entire licensing period. License tags shall be firmly attached to the dog's collar and worn at all times. License fees are NOT REFUNDABLE. Dogs: current Rabies Certificate & proof of sterilization. Cats must be microchipped in order to be licensed. The Burbank Animal Shelter offers microchipping services for $10 per chip. You can bring your cat in during Shelter hours to have a microchip implanted and pay the license fee of $5.00 during the same visit. Valid current Rabies Certificate (only applicable if your renewal notice indicates that your pet needs a new vaccination). Please call the Animal Shelter if you need your pets License #, Person ID or would like to confirm the date of your pets Rabies Certificate expiration date. Burbank Animal Shelter 1150 N. Victory Place, Burbank, CA 91506 Attention: Online Pet Licensing. Or fax to 818-238-3346. A Horse Registration application must be completed and returned to the Burbank Animal Shelter along with the $20 application fee. Horse Registration Application [PDF]. A $20 boarding fee per day or fraction thereof will also be applied. In addition, there is a state surcharge fee that ranges from $35 to $100 for dogs that are not spayed or neutered depending on the number of times the dog has been impounded.